An obsidian silence unfurled around Marne Montgomery as she stepped out of earshot of the Greek side of campus. Her heels clicked on the sidewalk, a sharp crack in the night air. Marne cast her eyes from side-to-side, suspicious of the shadows washing toward the sidewalk, like the ocean at night. Beacons of halogen lamps dropped halos of light onto the path, cutting the darkness that crept from the woods between campus and Greek Row. The event was billed as an opportunity to learn more about the sorority, but, in reality, was a chance for the sisters to scrutinize rushes and decide who would be asked to pledge. Marne had watched as hopefuls—some who actually thought they had a chance but never did—took pamphlets and eagerly asked questions and listened with keen interest. For Marne that was the most dreadful part, watching others who desperately wanted to fit in and knowing how rejected they would ultimately feel. Staci Gallagher, a senior and self-appointed queen of the sorority, had led a presentation on the history of the sorority. Photos of famous alumna were sprinkled with tedious trivia about the founding, past, present, and future of the sorority. Marne had spent much of the presentation imagining herself on a beach, bathing in the sun. She had become so engrossed, she could almost smell the salt air, hear the gulls call. Marne tossed one last glance back at the sorority house. Staci seemed a little too involved in her success for Marne’s tastes. Any attention or involvement from Staci was too much as far as Marne was concerned. If asked, Marne would have lied and said she liked Staci, though she could easily pinpoint a number of traits she hated: Staci’s obsessive concern for her looks and banal tastes in food and clothes as well as the fact that Staci seemed completely apathetic to any suffering besides her own. But Marne’s distrust and animosity went deeper. Marne knew that inside Staci lurked a truly malicious being wrapped and covered in a sticky, gooey, girly façade. Greek Row, where all the fraternities and sororities stood, was separated from the sheer masses of the campus by a river and stretch of thin woods that split the Grove University campus. The woods—about three acres wide—ran along the river where warehouses and businesses once stood. Old corner stones and even rusting wrought iron fences from buildings littered the woods. Such finds felt haunting, mysterious, like an archaeological dig, though the history of the street was well documented. The buildings had been destroyed by fire, though Marne couldn’t remember when. The river, seemingly small, had once been a channel for commerce. Now a recreational path wound along the edge between the river and woods and connected to a state forest on the other side of campus. How the world had changed! Marne thought. When stepping out of the Pi House, Marne considered visiting Brad, then asking him to walk her home, but decided against it. The night was seeping away quickly and she had some reading to do; she wouldn’t be able to drag herself away from him in any time shorter than an hour. Besides, the moon was full and cold and quiet of the night felt like comfortable companions. The lights and vociferous joy of the Greek side of campus dwindled behind her as she followed the path away from Greek Row and into the woods. Silence cloaked the woods. During the summer, she imagined the woods alive with bird calls and scurrying animals. Tonight, the night was crisp and clear and the wind still. Her footsteps crunched on the gravel path. A gray haze hung to the edge of the woods and filtered across the path ahead of her. As she approached, the fog dissipated, like a mirage chased and never found, though when she looked behind her, she could no longer see Greek Row through the haze. Suddenly, in the near woods, a sound startled Marne. Footsteps fell, loud, and trampling. She fumbled in her pocket for a can of Mace—you could never be too careful, rapists abound on college campuses—and she cursed herself for not walking with it in her hand. She directed her eyes away from her pocket to the origin of the noise. Her hand slid from her pocket freeing the can of Mace. Marne turned, looking in all directions. Around her, slowly at first, the haze crept toward her, enclosed her like a slowly moving fist. She unintentionally gasped as the night grew noticeably colder within the fog’s grasp. Marne shivered and hugged her arms to her body. She trudged onward. 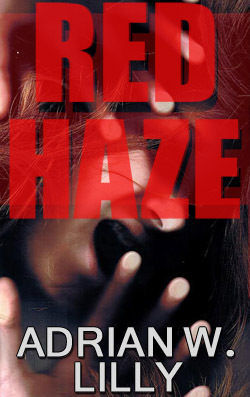 The thick haze blinded her. She couldn’t see the bend in the path that signified that she was nearing her side of campus, but she could hear the bubbling of the river, so knew she must be near. Her feet clicked off the gravel and onto the wooden bridge. She walked to the edge of the bridge and peered into the water just a few feet below. Mist clung to its surface but she could see the turbid swirls of the river below her. Now, the river was at a winter low and it wound its way through campus, as it did during the summer, as an innocent, delightful addition to the campus. The sound of it was soothing and the woods around it offered a place to picnic in the shade. But in the spring, the river would swell menacingly. Over the years, several students had died in the river, trying to swim, often drunkenly, when they shouldn’t have. The deaths had even spurred a campus legend that a madman was hunting students and drowning them. But, the deaths had happened over so many years, the killer would now have to be in his seventies and incapable of luring a young, fit man to his doom like a Siren. The idea of stumbling across the folded clothes and shoes of a fellow student on the shore, and knowing that the student’s body would later be dredged from the river was disconcerting, and was the stuff of urban legends, but toxicology reports always confirmed the obvious: drunken stupidity. Marne’s roommate, Sara Murdock, had written an article for the school paper just the year before after another young man had died in these very woods after a night of drinking—according to the article. Marne squeezed the railing and shivered. Listening to the river now, Marne felt it hard to imagine the torrent it could become and the toll it could take, as it bubbled over the rocks, splashing and ceaselessly seeking a place to run. Marne felt like that at times; she felt that she was constantly seeking the next place to run. She had felt that way since her brother, James, had died. She wanted to run from her last horrible memories of him, of his blood, his gasping for breath; she wanted to run from what it had done to her family: her medicated mother and alcoholic father; she wanted to run from the obligation she felt to fill the deep, gaping chasm left by his absence. Most of all, she wanted to run from her guilt. She should have saved him. Marne felt the heavy melancholy that dangled above her head at all times straining to break free and crush her. She swiped at the tears on her cheeks. Suddenly, she shivered violently as the night grew damp and cold around her and she felt someone standing next to her. She looked behind her. Marne gasped. The mist hovering at the edge of the woods swirled and radiated red. A red glow emanated from somewhere within the woods and reflected on the countless water droplets that hung in the air, turning the mist sinister, surreal. The light pulsed, turning the mist red again, then faded, and pulsed again, in quick, repetitive bursts that colored the night like a beacon. “What the hell?” She stepped away from the bridge and back onto the gravel path. The gravel crunched under feet. Marne took another step into the mist. She felt her feet slide in the wet grass as she stepped off the path. A slow moving figure trudged through the mist along the edge of the woods. “Hello?” She called. Marne stepped closer to the woods, her Mace raised. The figure was a young man, about her age. He paused and glanced back at her; their eyes locked. He hesitated only a moment before parting branches and vanishing into the red haze. “Wait!” Marne called. “Oh, God, please, wait!” She took a few timid steps into the woods then stopped, resting her hand on a tree. Around her, the mist stopped glowing. As the red glow retreated deeper into the woods, the mist became the simple, pale-gray it had been when she started into the woods. The boy was nowhere in sight. Shaking, Marne stepped back onto the path. She glanced back over her shoulder and peered into the still woods. The haze hovered between the trees, motionless, colorless. The waters below her continued to murmur. She trudged onto the bridge, her footsteps hollow and heavy on the wood, her heart pounding. Once across the bridge, she sprinted away from what she had seen. Enter to win a FREE giveaway at Book Maven’s Picks! by accident, and I’m surprised why this accident did not happened in advance! message house a bit, however instead of that, this is excellent blog.